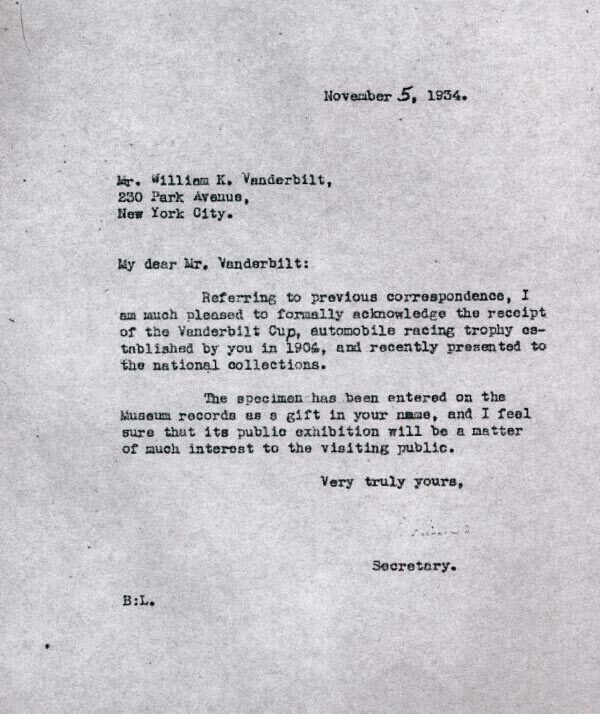 Vanderbilt Cup Races - Blog - Who Owns the Original Vanderbilt Cup Trophy and Where Is It Today? 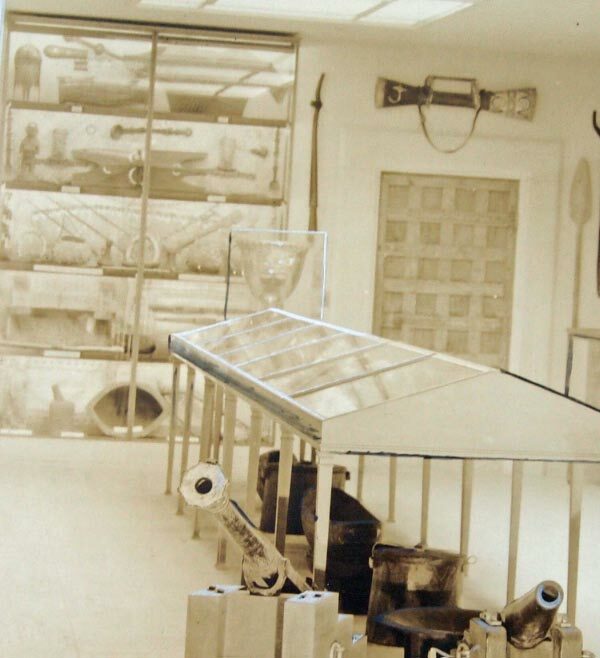 Linda, in June 1904,William K. Vanderbilt Jr. commissed Tiffany and Company to create the 10.5 gallon, 30-pound silver as the symbol of the Vanderbilt Cup Races. 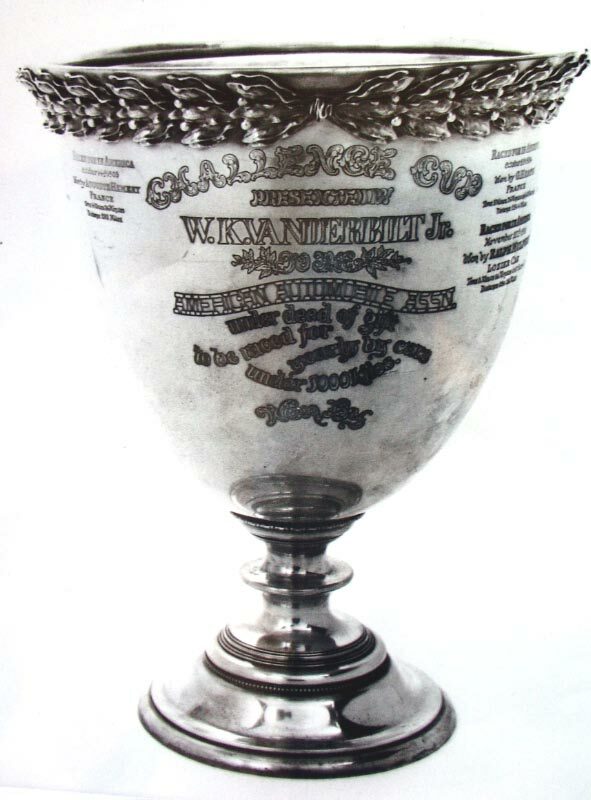 By providing a $3,000 bond, the winner of the Vanderbilt Cup Races from 1904 to 1916 could hold the trophy for one year using it for events and trade shows. 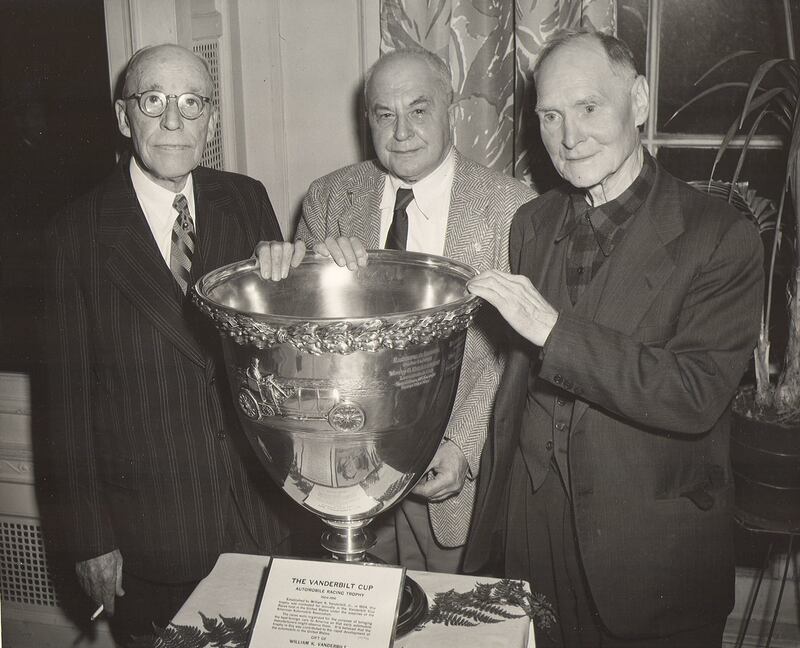 The $3,000 bond was returned to the winner when the cup was returned to its owner, Willie K.
From 1917 to 1934, the Vanderbilt Cup returned to William K. Vanderbilt Jr. As shown in this rare 1930s photo, courtesy of the Suffolk County Vanderbilt Museum, Willie K. displayed the cup with his marine artifacts on the second floor of his home in Centerport, Long Island. On October 8, 1934 on the 30th anniversary of 1904 Vanderbilt Cup Race, C.G. 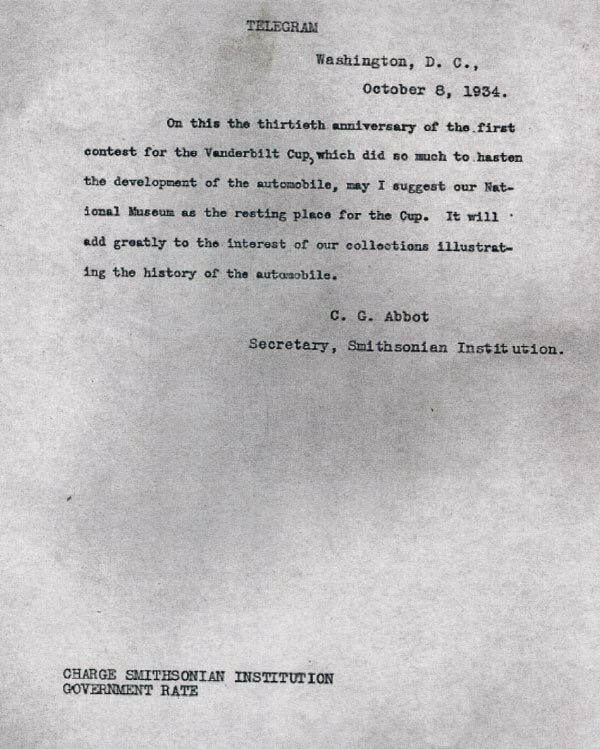 Abbott, Secretary of the Smithsonian Institution, sent this telegram to Willie K. requesting "the "National Museum" as the resting place for the Cup." 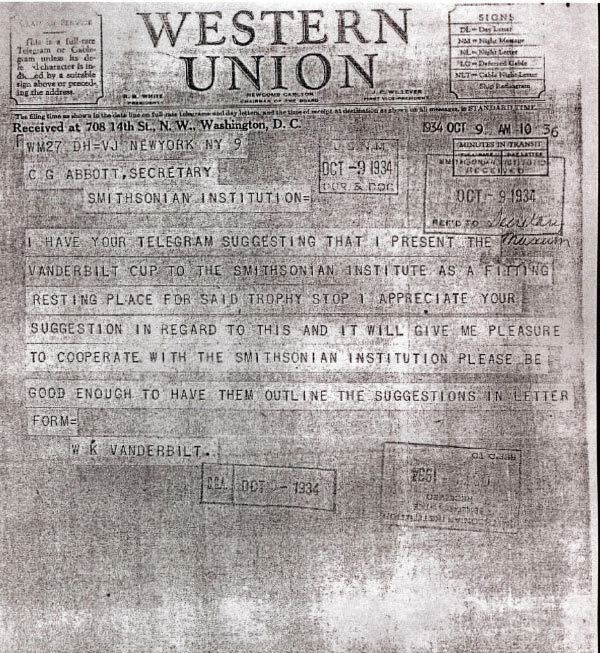 The next day, Willie K. responded in this telegram: "I appreciate your suggestion in regard to this and it will give me pleasure to cooperate.. Please be good enough to have them outline the suggestions in letter form."" 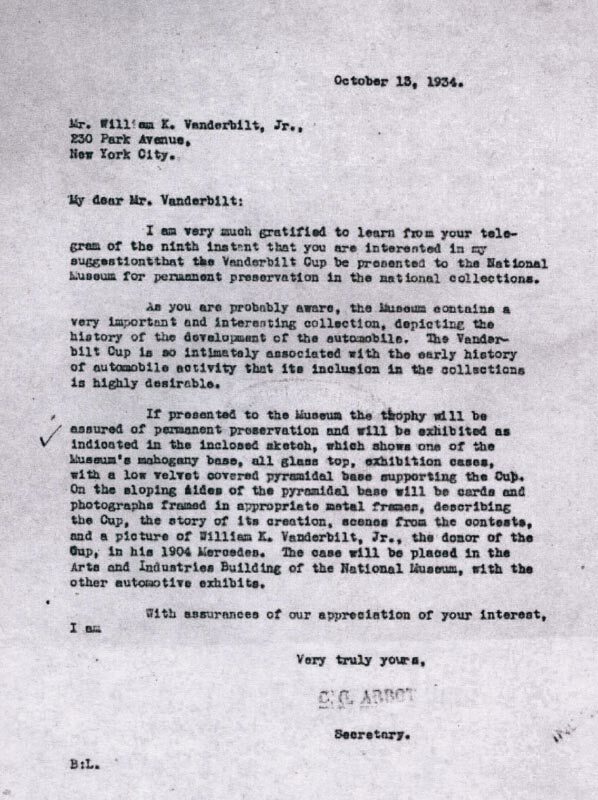 Abbott responded with this October 13, 1934 letter: "If presented to the Museum the trophy will be assured of permanent preservation...The case will be placed in the Arts and Industries Building of the National Museum, with the other automotive exhibits." 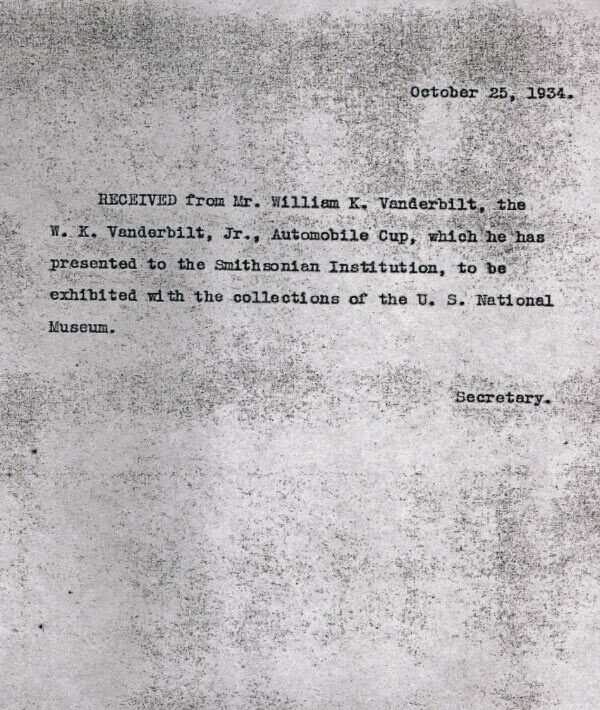 Less than two weeks later, the Vanderbilt Cup trophy was part of the Smithsonian collection. On November 5, 1934, Abbot sent a thank you to Willie K.:"I feel sure that its public exhibition will be a matter of much interest to the visiting public." Over the last 79 years, the Smithsonian has lent out the Vanderbilt Cup trophy for special events including the 50th Anniversary of the First Vanderbilt Cup Race at the Garden City Hotel on October 9, 1954.Three participants of the 1904 race were seen here holding the cup; George Arents, Jr. (left), driver of the crashed Mercedes, Joe Tracy (right), driver of the Royal Tourist and his mechanician Al Poole (center). In June 2002, the Smithsonian loaned the Vanderbilt Cup for a Stony Brook exhibit The Crowd Goes Wild! Spectator Sports on Long Island- the last time this historic trophy was on Long Island. 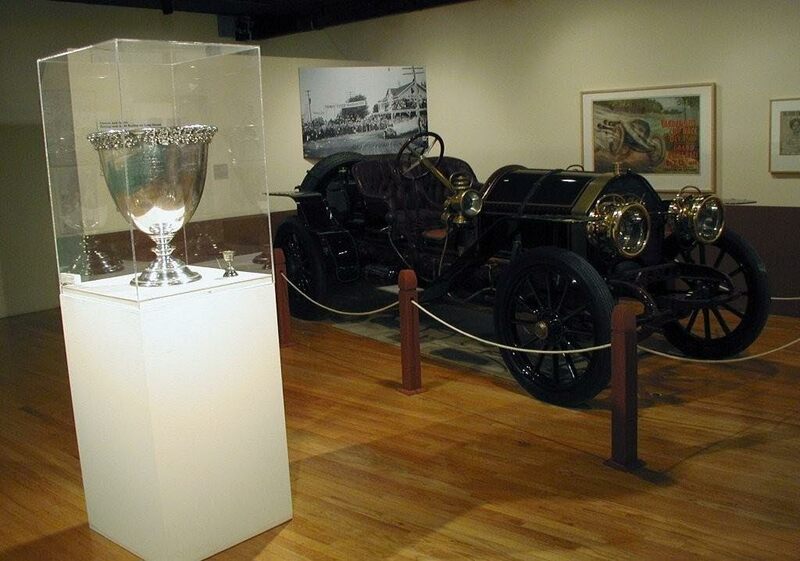 In addition to the cup, the exhibit featured Walter McCarthy's 1908 Simplex. Over the last decade, the trophy has been stored in a Smithsonian locker and rarely seen. 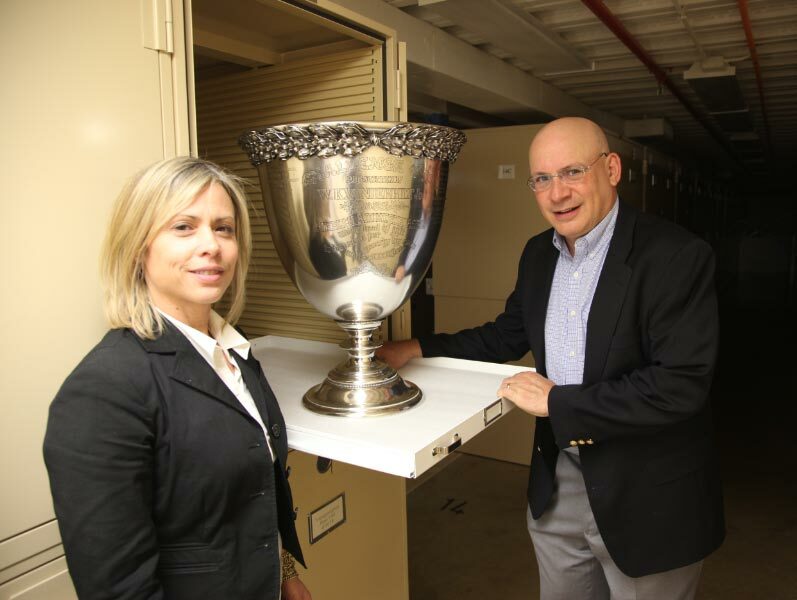 On May 9, 2009, Stephanie Gress, Director of Curatorial Affairs of the Suffolk County Vanderbilt Museum, my wife Roz and I took a special trip to the Smithsonian storage facilities in Maryland and paid our respects to this historic trophy. It is hoped that someday that the Vanderbilt Cup trophy will return to Long Island for a long-term loan. Does anyone agree? I almost fully agree with you Howard! Except I believe it should be on permanent loan here at the Vanderbilt museum along with “Old 16” along side it! Now that would be a real good boost in revenue for the museum1After all it was our races and our cup! It’s like the “Elgin Marbles” being in the British museum, why it’s positively sacrilegious! Brilliant Idea! William K would approve too. Thanks for this very interesting story. As I am sure you know, after WW II, there were renewed Vanderbilt Cup races held at Bridgehampton for which a trophy was given. I had heard that it was last held by EMRA and then disappeared. Do you know anything about this? Was this a new “Vanderbilt Cup” that had been produced for these races ? I am sure I saw it at some point as I was at several of those post WW II events but I do not remember it or what it looked like. Thanks for any information you can shed on this. Thanks for answering a question many of us had and never thought to ask. It’s certainly a pity that the cup isn’t on permanent display at the museum; absent that, it should come back to Long Island. How about on your mantle at home? It’s great the Smithsonian offered the “Cup” a permanent home, but I have to take issue with it being stored in a locker. I f that’s the case then return it to the family and maybe let them display it in the Long Island estate. It would be nice to have it on Long Island, but I am not completely sure where the proper display location is at the moment. Unfortunately, security is a bit of a problem for a 30 lb. piece of silver. I would agree. The trophy is certainly part of Long Island history. To me it makes sense to display it at the Vanderbilt Museum here rather than storing it out of sight at the Smithsonian. I agree that the Trophy should be displayed for public viewing and what a better place than it’s original home where the history began. I totally agree that historical items like these should have an appropriate place for public viewing to carrry on the history to future generations. Out of sight out of mind! Good Luck Howard. Howard - Excellent historical background on ‘the Cup’. I would certainly concur that it should be returned to a place of honor where it would mean the most - Long Island. Sounds like a great idea - wonder if it was made with Mackay silver? Fascinated by the story! Thank you very much. seems a shame to just be sitting in a ‘locker’ at the smithsonian and to only come out when ‘requested’...there must be a better place for it! It needs to come back to secure and public display on Long Island. Exactly what I would expect of the clowns who run the Smithsonian: keep the great artifacts locked up without apology or explanation. Screw the public! However, put a little cash on the table and they’ll make your commercial venture somehow seem significant. Case in point: when Air and Space removed a couple historic aircraft to make room for a Fed Ex display. I almost threw up! I also agree that it should come back to Long Island, but the big question is where is there a totally secure place for it to be displayed?